The club’s General Meeting on April 25, 1-3pm, is all about getting ready for our annual PLANT SALE! There is NO SPEAKER at this meeting. 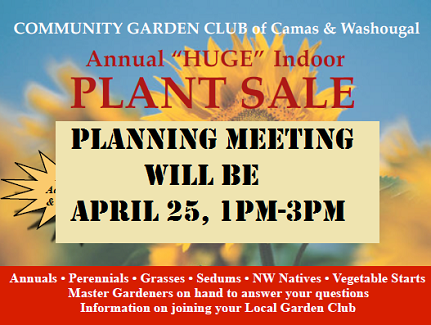 Instead, the club’s Plant Sale Committee will be bringing club members up to speed with what needs to be done between now and the BIG DAY May 19th, from 9am-3pm, in the basement of the Camas United Methodist Church, 706 NE 14th Avenue in Camas. If you’ve been thinking about joining the club, this meeting, or at the Plant Sale itself on May 19th, or at the May 23rd General meeting are all good times to join before the club goes on public hiatus until August 22. Becoming a member of the club has some great perks like being able to shop early the day before the official Plant Sale. And, through the rest of the summer, the club members go on a lot of great field trips to public and private gardens and other fun garden events. Which is why we don’t have meetings June or July – we’re too busy in our own gardens and visiting others!